The Pricing Dilemma and How to Avoid It — Helping you get found, get liked, and get more business online. Have you ever severely underbid a project or said you would do something, but later found out you’d committed yourself to way too much work for your return on investment? The worst thing is the client KNOWS I priced the work way too low, but he’s still demanding an even deeper level of service than I owe him. But… whose fault is it, really? I pride myself on over-delivery. I want the client to be more than satisfied. I want him to be ecstatic. 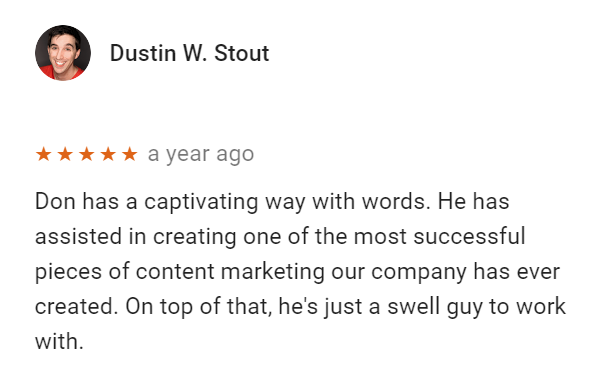 I want him to write a review like the one Dustin Stout wrote about my work last year (see the screenshot below). I want both of us to be glad we found one another and decided to work together. When I’m disgruntled with a job, I push myself to keep a smile on my face and put the customer first. But this situation is tough. The customer already has more than his money’s worth. We both know that to be true. In November, I signed up for a monthly subscription to a service of real value to me. In December, I received an offer to take a yearly subscription to the same service at a discounted rate, so I wrote to the owner and asked to be released from monthly and take the yearly. A few months later, I received an offer for a lifetime subscription — an even steeper discount. I took… but felt a bit irritated. I mean, why not tell folks upfront: Here are the price tiers, which do you prefer — monthly, yearly, or lifetime? Again, I benefit from the service. There’s no doubt in my mind it’s worth the money at every level. So, I bit my tongue. Then, something else happened with the vendor. I won’t go into detail, but it seemed as if he had circumvented me to obtain something for his own benefit that I had made possible for him. That pushed the frustration I already felt up to a level I knew I should deal with. I let him know how I felt. We talked. We agreed we both wanted the relationship to continue. And he refunded the cost of the yearly. I purchase his product, step up to the next level, and that’s a problem??? Anyway… you can feel the frustration. I can feel the frustration. He can feel the frustration. But what’s really at the bottom of it? Looking at my own situation, I can see the reason for my frustration is that I priced my work too low. That is NOT the client’s fault. It’s entirely my own. Looking further, I can see that when I’m asked to deliver on something I priced too low, I get resentful. After all, I should be paid more for the service. On one hand, I devalue my worth by low-balling to get a job. On the other hand, I devalue my services by balking on providing rock star services for the job. In the end… nobody really wins. The job is lackluster and the whole thing tastes bad. If you think you should be paid more for doing the work, then ask for more money when you price the work. After you’ve accepted a job, do the job. Put a smile on your face, love in your heart, and do what you said you would do. Do even more than you said you would do.